UPDATE SOLD - Congratulations and thank you to Cody Walton from Lufkin. UPDATE: SOLD - Thank you and congratulations to Karen, Heather and Ashley Roland on their new filly! This bay gelding is started, has been on the Rope-O-Matic Buford and is now tracking steers. He's a nice horse, very gentle and easy to handle and get along with. Would make a great heel horse. This mare is a nice working ranch horse and a great heel horse. She handles very well and would make a great team penning horse. UPDATE: SOLD - Congratulations and thank you to Abel Montoya from Uvalde. 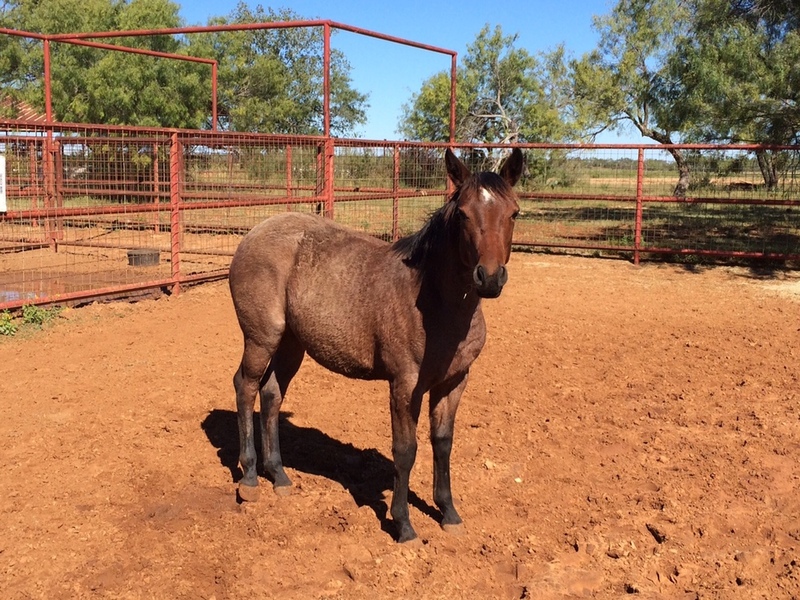 This blue roan filly is by our own Timber Hawk Hancock and out of a daughter of the great Mecom Blue. Mecom Blue has offspring earnings in the NCHA over $934,000! Dam: CTR Blue Dancer by Mecom Blue - NCHA LTE $21,972, #41 Equi-Stat Cutting Horse. Mecom Blue's offspring earnings are over $934,745 including Quintan Blue, 2004 NCHA Futurity 3 YO Open Reserve Champion and Laredo Blue, 2003 NCHA Futurity 3 YO non-pro champion. UPDATE: SOLD - Thanks and congratulations to Wes Hindes of Charlotte. This bay roan gelding is started, has been on the Rope-O-Matic Buford and is now tracking steers.